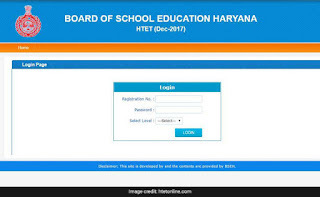 Board of School Education Haryana Released Admit Card for HTET Exam 2017. Board of School Education Haryana Released Admit Card for Haryana Teacher Eligibility Test (HTET) exam 2017. Exam is scheduled by BSEH on 23rd and 24th December 2017. Candidates who applied for the HTET exam 2017 can download their admit card from the official website of HTET at http://htetonline.com/ or from the direct link given below. It is advised to candidate to read all instruction given on admit card, read throughly.